Like John Lennon a quarter of a century before him, Alex was born at Oxford Road Maternity Hospital, Liverpool, as the Beatles’ latest single Eleanor Rigby/Yellow Submarine sat atop the charts. 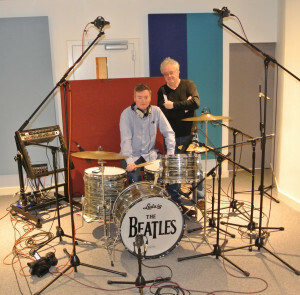 A drummer for many years, he has enjoyed a career in TV sound, most notably working on Channel 4’s Brookside and Hollyoaks, plus numerous productions for BBC, ITV and Independents. He is particularly proud of his contribution to the BBC documentary of another of his heroes, Dennis Wilson -The Real Beach Boy. Our paths crossed at Mersey Television in the early 90’s, where Terry was employed as a consultant on the excellent drama series And the Beat Goes On, which aired on Channel 4. The series told the tortuous story of a Merseybeat group in the early Sixties. Terry’s first-hand knowledge of the period proved invaluable to the production, his sourcing of authentic instruments of the period was especially memorable. Terry would later join Mersey TV on a permanent basis, handling music clearance for the company’s productions. As I was also employed on these shows as a dubbing (re-recording) mixer, I found myself working closely with Terry, and as drummers both susceptible to the charms of importing vintage drums from the States, we struck-up an instant rapport. Many years later, having both left the company, we remained friends, and when I began this project I invited Terry to help out. As Paul McCartney alludes to on the track Early Days from his album New, I felt it vital to call upon someone who was actually around to witness the incredible musical explosion that was soon to engulf the world. 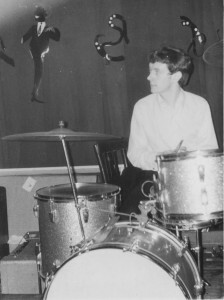 Terry is that rare beast – a drummer who regularly saw the Beatles at the Cavern, and for this book he is able to offer first-hand experiences of seeing both Ringo and Pete Best play with the group. 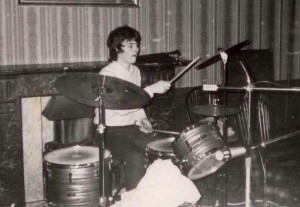 He is also able to provide us with a feel for what it was like to be a drummer during the incredible period that was the 1960’s – both the tools available and the constraints within which the musicians performed. What started out as a book by Alex Cain with Terry McCusker, became a book by Alex Cain and Terry McCusker, and it’s all the better for it. After leaving school, Terry was lucky enough to be working in the same building that housed the famous Cavern club in Liverpool. Here he was able to observe the birth of Merseybeat, and of course to see – close up – the most famous of all of those bands. Within three years of seeing the Beatles at the Cavern, Terry was himself playing the sweat-clubs of Germany and elsewhere. Working as a freelancer he has played all over Europe, America and the Middle East with many varied bands and artists on stage, screen or radio. Still in demand, he can be seen doing anything from powering along a ten-piece, or merely standing up playing his cocktail kit with a trio in his local pub. I was delighted to be asked to take part in this project by my old chum Alex Cain. We had worked together for Mersey Television on various programmes, he as a dubber, a very skilled and demanding job requiring high concentration levels and an ability to edit and enhance the audio track in conjunction with added effects and music to video footage, and me as general dogsbody. He worked in a dubbing suite situated next door to my ‘office’ – which in reality was little more than a converted broom cupboard. We found that we had lots of things in common, not only are we both drummers, but we like all kinds of music and in particular the Beatles of whom Alex has an in-depth knowledge. He can deliver devastating one liners, usually with the intention of pricking the balloons of pomposity or aimed at the perversity of inanimate objects. Like me, he is an inveterate giggler with an ability to see the funny side of life and many a day passed where one or both of us was reduced to watery eyed helplessness, retreating to our lairs, bent double with aching ribs.